Lionsgate Entertainment - founded by Canadian businessman Frank Giustra. aircraft, third when all aircraft is considered - behind only Boeing and Airbus. CAE, Inc - key player with global reach. provides simulation and related technologies as well as training services to the civil aviation industry and defense forces. CAE offers civil aviation, military and helicopter training services at 40 locations worldwide where it trains more than 80,000 civil and military crewmembers annually. Blackberry - the smartphone market share leader in Indonesia, South Africa, Argentina, Middle East. Leads all companies in the corporate market - Majority of Fortune 500 companies use the BlackBerry. TD Bank -Manages car insurance for Chrysler North America. October 2016 paid $4 billion for Scottrade America's largest online brockerage for stocks. 3 million accounts $1 trillion assets. store operator has stores in USA, Europe, Mexico, Japan, China, Vietnam, Indonesia. June 20, 2012 pays $2.8 billion to takeover the largest oil and gas retailer in Scandanavia Statoil Fuel & Retail. 623 corporate stores in Arizona alone ! Magna International - Builds vehicles, constructs auto parts for GM, Chrysler, Toyota, Ford. A sterling reputation and lack of allegiance to any one company make it a top choice for automarkers looking to contract out work. considered buying opel, saab but bowed out of the bidding process so as to avoid any conflict of interest with its largest customers. Barrick Gold - World's largest gold company and producer owns some of the largest gold mines in South America (Veladero, Lagunas Norte, Pueblo Viejo 1 million ounces per year), Australia (Super Pit), Africa and the United States (Goldstrike, Cortez). Goldcorp - Owns 100% of Penasquito a Mexican mine with over 1 billion ounces of 2P silver reserves. Ontario Teachers Pension Plan Board - Largest shareholder in a number of major foreign companies including 27% stake in Northumbrian Water Group, the main servicer of water utilities in England. Insurance - Manulife Financial, Sun Life and Great-West Lifeco are three of the 30 biggest insurance companies in the world. Hudson's Bay Company - HQ in Toronto. Subsidiaries include Saks Fifth Avenue, Lord and Taylor, Galeria Kaufhof leader in Germany, Sportarena 40th m2 retail space in Germany, Greece, Europe. Saputo - World's largest cheese producer. SNC Lavalin - Major engineering firm. Since 2012 owns the rights to CANDU nuclear division of Atomic Energy of Canada Limited. Candu nuclear reactors were among the first used in China, Pakistan, Venezuela, South Korea, Romania. MTY Food Group - with the number of fast food locations pushing 5000 this rapidly expanding food service operator is quickly becoming a household name. In 2016 it acquired Kahala brands giving it a major foothold in the US market (cold stone creamery). May 2017 opened the first Thaï Express stateside. Fairmont Hotels and Resorts - headquarters remains in Toronto despite takeover by Accor. Four Seasons Hotels - Another widely popular international brand founded by Torontonian Isadore Sharp. Canadian companies equal Investment Opportunity ! Shopify - lucrative deal in place with instragram gives it an edge over the competition. DHX Media - Halifax-based company with lucrative assets. Is currently the leading independent producer of children's programming. Major acquisitions - Iconix Brand Group ($345m, May 2017), Cookie Jar Group/Cinar ($111m, August 2012), and a number of others. DHX owns the rights to teletubbies, peanuts, strawberry shortcake, inspector gadget, paddington bear, arthur, caillou, degrassi, and many others. eOne entertainment - major film (alliance films) and tv production company. important distributor of independent movies. Scotiabank - large scale operations in South America. Pacific Rubiales Energy - Fastest growing private company in Colombia. One of the largest investors in South America among foreign oil producers. High Liner Foods - North American leader in packaged seafood meals to grocery stores. based in Lunenburg, NS. Nova Scotia despite being Canada's second smallest province, it is home to some big name companies: Sobeys, Clearwater, High Liner, Crombie reit, Jazz Aviation, Oxford Frozen Foods, Eastlink, Maritime Travel, Maritime Life, IMP Group/cascade aerospace, Stanfields, Larsen Family Meats, Acadian Lines, Grinners Food Systems. New Brunswick also deserves more attention; little exposure has more to do with the fact that many companies are privately held. Irving Oil, McCain Foods, Ganong, Bell Alliant. Clearwater Seafoods - leader in scallop and other seafood supplies. One of the largest vertically integrated seafood companies. Valeant Pharmaceuticals - Montreal-based pharma company. Owns such brands as Bausch & Lomb. May 2014: $47 billion takeover bid for Allergan Inc; if accepted Valeant would become one of the world's five largest pharmaceutical companies. Owns Egypt's leading pharmacy distributor. Vermilion Energy - France's leading oil producer. Loblaw Companies - Private clothing line Joe Fresh Style sold at 600 J.C. Penney locations across the United States. Irving Oil - Network of gas stations extends into New England. Corel - Ranks among the market leaders in vector imaging software. Thomson Reuters - A leader in global media reporting. Largest shareholder is Canada's wealthiest person Kenneth Thompson Jr.
Petrobank, Suncor, Cenovus - Own key patents used around the world for the extraction and processing of oil and gas. Potash Corp of Saskatchewan - Leading supplier of fertilizer. Indigo Chapters - The bookstore chain plans to open up new stores stateside beginning in 2014. Already secured deal with Apple for e-books - will open 40 Apple in-store locations. Lululemon - Exercise clothing retailer. Canadian National Railway - world's second largest train company by market value ($35/$45b) serves USA, Canada. Com Dev International - communication satellite components. Celestica - third party design and manufacturer of electronic devices. competes with foxconn. Brookfield Asset Management - leading purchaser of private properties in 2015 in the EU. Total asset value of $160 billion as of May 2017 is second highest among all real estate companies in the world, behind only China Evergrande Group ($194 billion). ranks #202 on Forbes 2017 edition of the global 2000 list. It's headquarters in Toronto is Brookfield Place, formerly the widely known twin skyscrapers of BCE place 900 feet. as of 2017 58 of the world's 2000 biggest companies call Canada home. Tied with France & India and just behind South Korea (64). 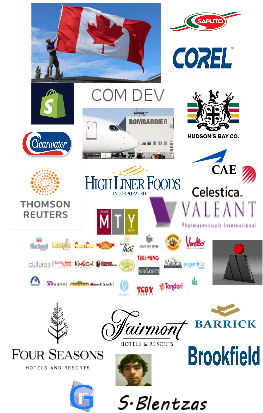 Canada is home to a diverse array of companies whose influence extends beyond Canada's borders. The industries they play a vital role in include technology, aerospace, train transport, banking, insurance, food retailing, computer programming, insurance, oil, gold mining, transportation, fertilizer, gas, among many others. also notable: Inventor of the image tracing software Portrace used by Inkscape teaches math at Dalhousie University.